Helen Pilcher is a science writer and comedian – and not many people can claim that. In this book she looks at the possibility of de-extinction – bringing back extinct species – and searches for the species most worthy of the effort. This book made me laugh (as early as the last four words on page 10) and made me think (many pages and for a quite a while after finishing the book). Helen Pilcher has a track record in doing science (a PhD in fiddling about with DNA) and in writing about it, and that’s a lot more important to the success of this book than her background in comedy (though that definitely helps too). This is a serious, but yes, amusing, overview of what de-extinction might entail, how feasible it would be (a very interesting review to my mind) and how desirable it would be. The reader is invited to let their imagination run riot at the beginning and to think which species they would like to see back on Earth were it possible to do so, and then we are brought through a series of reality checks to the realisation that not much is feasible and not that much is desirable. But the journey is very enjoyable. The Passenger Pigeon makes an appearance and the right decision is made, in my opinion. And when Pilcher reveals her choice for the species to benefit from the possibility of de-extinction she makes an excellent case – but I’ll leave it to you to discover for yourself. I notice that others have praised this book for being funny – some of it is funny but that is almost a slight to the skill of the author. This book should win prizes because it takes the ‘we could do this’ of the subject and examines its real possibilities but then moves on to the more important question of ‘should we do this?’ and treats that very seriously (in a very readable way). There are many things that we can do that maybe it would be better if we didn’t do. Is space exploration really worth the money? Is Trident worth the money? Is the spend on medical research to make us live longer on an overcrowded planet really worth it? This book takes a somewhat unpromising subject and makes it fizz. It’s a really good read and will make you think. Ugly cover – that’s a shame. 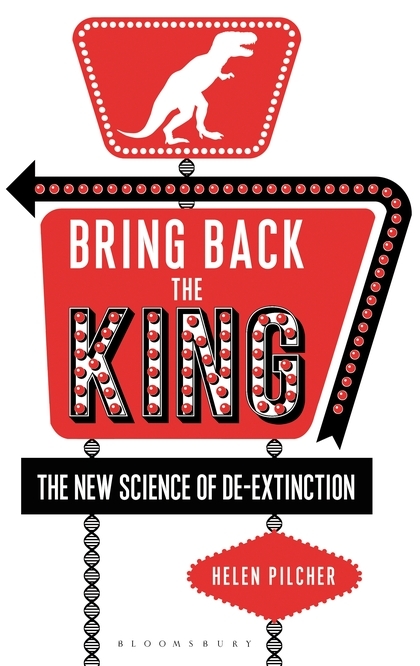 Bring Back the King – the new science of de-extinction by Helen Pilcher is published by Bloomsbury. Inglorious: conflict in the uplands by Mark Avery is published by Bloomsbury – for reviews see here. Updated paperback edition now out. Thanks Mark, great review. Would have been unlikely to spot this book as a good read - the cover and title! But now I can't wait. See what a service you provide to Christmas list writers. Best wishes for Wednesday, we're all with you on this one. Ditto to that Mike. Good review, have ordered already on line. Hope your on commission Mark. But it's Tuesday that Mark needs the thoughts. All the very best for Tuesday Mark. We, and all the persecuted wildlife, will be rooting for you (and don't forget the frogs!). Paul and Melanie. "Hope you're on commission Mark"
I imagine not - it would rather undermine the credibility of the review. Er, I was joking of course!! I think de-extinction should be given serious consideration by conservationists. DNA technology and technology generally is moving so fast these days there is no telling what might be possible in a few years time. I first came across the concept in 1980 when I saw an article about it in a French science magazine. I was 13 and my French was, is, atrocious, but I cottoned on to what the article was about immediately. Was one of the most exciting moments of my life, will never, ever forget it. Huge technical challenge, but getting smaller every day. If technically possible what would be ethically or practically wrong with putting back Great Auk, Steller's sea cow or amazing animals such as the Madagascan aardvark, New Caledonia crocodile, Cuban giant owl, adzebill, sloth lemur - species even most nature lovers have never heard off, but which humans were almost certainly responsible for killing off as with dodo, passenger pigeon and thylacine. Tragic, but reversible? A sad reflection but in the interim we keep letting more go the same way? You could imagine in a century's time perhaps (if the planet hasn't been totally trashed by then) returning to the same discussion? Who knows William might save the Rhino, Elephant, Tigers etc. ?